The finest names in the freight transport industry were recognised during the Freight Transport Association’s (FTA) Logistics Awards this week. Britain’s transport minister Jesse Norman MP attended the inaugural event and took the opportunity to praise the performance and contribution of the UK logistics industry to the national economy. Over the course of the evening, Delamode was named freight carrier of the year, while John Lewis Partnership picked up the retail shipper of the year award and thyssenkrupp AG collected the gong for 2017’s best manufacturing shipper. Logistics partner of the year went to TomTom Telematics, and Cartwright Group was praised for developing the most innovative product of the year. The year’s most innovative company was deemed to be Freightliner. Flogas Britain Ltd was 2017’s logistics champion in regards to essential services, while the London Borough of Croydon’s pollution team was the logistics champion for public services. Finally, the logistics lifetime achievement award went to James Cooper of Associated British Ports. FTA chief executive David Wells said the awards showcased the very best of British industrial delivery and innovation. 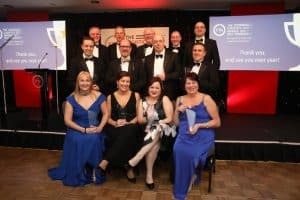 “The inaugural FTA Logistics Awards have proved a great success, celebrating outstanding performance in multimodal supply and logistics from businesses both big and small,” he commented.